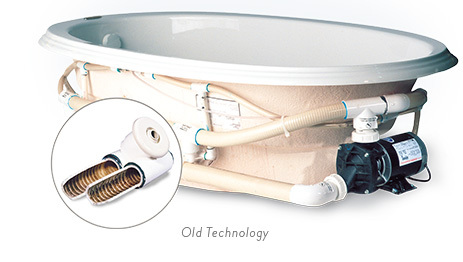 In 1993, as bath manufacturers, we were shocked to discover that there was no effective solution for removing the residue and dangerous bacteria found in the hidden pipes and air channels of traditional whirlpool baths. After 7 years of research and development, Sanijet Pipeless™ Technology was born. Sanijet introduced the world's first and only whirlpool jets that require no pipes, air channels, bulky pumps or blowers. Continuing to revolutionize the industry, Sanijet then developed the S1 Pipeless jet for pedicure sinks and walk-in baths. Today, Sanijet Technologies is renowned for offering the cleanest, safest, quietest, highest quality Pipeless whirlpool jets in the world.